A hot water dispenser may sound like a posh name for a kettle but it is actually a relatively new device for dispensing a single cup of hot water to make a quick cup of tea or coffee. It is not really designed as a replacement for your kettle but an energy efficient alternative when you only want to make one hot drink. The benefit of an instant hot water kettle is that you can make a quick hot beverage in around 40 seconds. These devices dispense near boiling water at the press of a button. There are technically two types, ones that heat the water as it is dispensed and the other that boils the water then dispenses it. The updated seconnd generation hot cup from Breville. The original first generation hot cup from Breville. Third generation hot cup with Britia water filter. The One Cup from Morphy Richards. Could this be the fastest quick boil kettle on the market. The original but now discontinued hot water dispenser. Some of the commonly asked questions about hot water dispensers are answered. You can save £30 a year by using a hot water dispenser rather than a kettle to make your hot drinks. The Breville Hot Cup (VKJ318) replacement for the VKJ142, is the second generation model and currently the best selling dispenser. 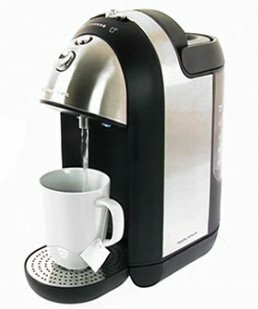 It can dispense a full mug of hot water in a little over 40 seconds. It holds 2 litres of water in its reservoir which is enough for about 5 or 6 cups before it needs refilling from the tap. A useful feature is the ability to adjust the cup size up to 300ml, which was not present in earlier models. So whether you drink from a large mug or small cup you can boil just the right amount of water. There is also a cancel button that can be used to stop the boiling or water dispensing if you decide you didn't want a cuppa right now. Additionally there is a built in permanent limescale filter for those who live in hard water areas. The Hot Cup comes in black gloss and a stainless steel polished finish which seems to be the style these days. When boiling and dispensing the reservoir illuminates in a fetching blue colour. This is the older model or first generation of the Hot Cup. Whilst it is about a tenner or so cheaper it does lack a variable dispense option so you are stuck with a 250ml cup size and it has a smaller 1.5 litre water reservoir. 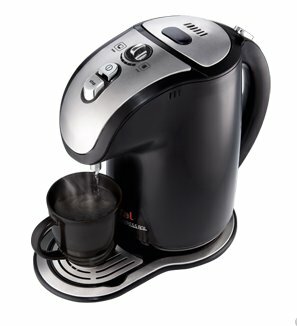 It also has a 5 second slower boil and dispense compared to the second generation VKJ318. The newer third generation model of the Breville Hot Cup. The features are similar to the VKJ318 except it has an additional Brita Maxtra filter to remove chlorine and 20% more limescale removal. It also has a slightly smaller 1.8 litre water storage capacity and comes in a rather fetching polished stainless steel. The Meno One Cup can dispense a cup of boiling water at 98°c in 45 seconds. The cup size can be adjusted between 150ml and 300ml so that you can dispense the right amount of water for your particular cup size. You can also stop the water boiling and dispensing process with the handy cancel button just in case you have set the cup size too high or have changed your mind about making a cup of tea. You can store between 6 and 12 cups worth of water in the 1.8 litre in the water reservoir. There is a carry handle on top of the Meno so that it can be lifted to refill the reservoir at the tap or conversely just fill it from a jug. Tefal's unit, the aptly named Express Boil seems to have a slightly quicker boil and dispense time compared to the Breville Hot Cup. Conversely Tefal claims that the average temperature of the hot water the unit dispenses is a mere 91°c which is lower than it's competitors, this would probably explain the faster boiling time. As it is faster to boil and dispense a cup of hot water albeit not as boiling as the Hot Cup or the Meno One Cup then this makes it a good buy for those who are mainly coffee, green or herbal tea drinkers. There seems to be a consensus that black tea or blended tea like Tetley (my favourite) needs near boiling water so your cuppa may not taste as good or appear to cool down too quickly with the Express Boil. Just like the other later generation hot water dispensers on the market the Tefal Express Boil has a 3000 watt concealed element, 2 litre water storage capacity and a variable cup size ranging from 160ml to a larger 260ml. One of the design advantages of this model is that it can be removed from the base to easily refill at the sink. There is the issue as with all the instant hot water kettles that they are heavy once filled so a preferable alternative is to use a jug to fill the reservoir. The downside of this particular model is that the water gauge where you can see how much water is in the reservoir is at the back so you have to swivel it round to take a look. Although I think the unit is designed to sit on your sideboard side on it seems natural to place the Express Boil front on so that the water gauge is at the rear. I've checked on several Youtube videos where others seems to do the same thing. A minor niggle maybe but a larger viewing window or a clear reservoir like the Breville filter (VKJ367) Hot Cup would solve this problem. The Tefal Quick Cup works in a different way to the other hot water on demand kettles in that it heats the water as it dispenses it rather than boiling it first and then dispensing it. In theory this is a better system but unfortunately both the original Quick Cup and the later deluxe model were both plagued with problems. You can still get hold of one but Tefal is no longer selling them, I cannot confirm whether they have actually stopped making them at all. Rather than boiling the water their patented technology heats the water as it is dispensed so that from pressing the button hot water starts filling your cup in 3 seconds. It still however takes about 40 seconds to completely fill your cup. Whilst in principle this is a better idea than boil and dispense as you can stop filling your cup by pressing the stop button at any point so you really are only heating the water that you need. 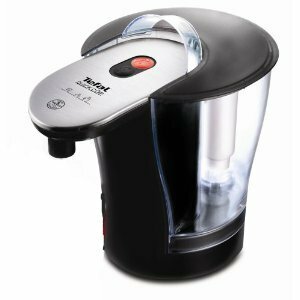 Tefal now only have their Express boil model that uses the boil and dispense method as it is more reliable and produces water hot enough for tea which at the end of the day will be what most people want. According to research done by Tefal (they don't specify where this research is) they claim you can save £30 a year by only boiling the water that you need. By not boiling more water than you need you are reducing the amount if electricity that you use. Switching on any kettle uses the same amount of electricity as switching on 270 energy saving lightbulbs at the same time. Who would benefit from a hot water dispenser? If you tend to make lots of individual cups of tea you would benefit the most. These types of dispensers are not designed to replace the job of a kettle where you are making multiple cups of tea at a time. Will the water be hot enough for making tea? They work the same way as standard kettles, the only difference is that they only boil just enough water for one cup of tea at a time. The water is boiled to 100°c just the same as your current kettle. Does the Breville Hot Cup range actually boil the water? Essentially the Hot Cup is just a kettle that is able to measure out and boil just the water that you need then dispense it into a cup. 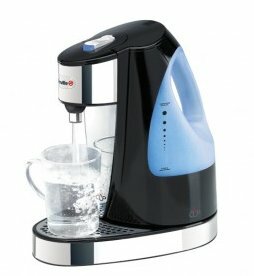 Breville claims the water is actually boiled to 100c so is suitable for making tea.